AmCham Slovakia publishes a wide variety of publications, most of which are available to download, free of charge. You can view the full list below. One of the most significant roles of the American Chamber of Commerce in the Slovak Republic is to develop activities that contribute to supporting the influx of foreign investment to Slovakia. AmCham Slovakia is keenly aware that there is still excellent, untapped potential in the promotion of the country. AmCham Slovakia, in cooperation with ECENTER, annualy published the "Slovakia in Figures" brochure. Therefore we offer assistance in the promotion of the Slovak Republic as a country with huge investment potential. This brochure provides you with information on a great variety of aspects of the Slovak Republic. Including the geographical, economic, social, political, and financial areas. All AmCham members are able to download "Slovakia in Figures" brochure in PDF file. You can also order more copies of this publication in print form. 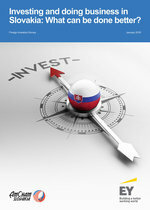 AmCham Slovakia, in cooperation with EY, has conducted its second Foreign Direct Investors Survey. The goal of this survey was to identify current conditions and barriers to foreign investors doing business in the Slovak Republic. This report summarizes the key findings of our survey and provides policy recommendations for the government, businesses and educational institutions. We hope that, in a small way, it will contribute to developing a healthy business climate and improving conditions for businesses operating in Slovakia. Recognizing that the energy market constitutes a significant part of the Slovak economy – and in its efforts to provide additional benefits of membership to ALL members – AmCham Slovakia is pleased to announce a new publication: "Slovak Energy Market Overview 2013". This comprehensive publication, which was produced in cooperation with Energy Analytics, features a brief and concise overview of the most important facts and figures concerning the Slovak energy market, including electricity, gas, oil, heat and renewables. We hope you will find the information presented beneficial for other people in your company and for your existing and potential business partners. Please do not hesitate to use the attached form to order more copies. The American Chamber of Commerce in the Slovak Republic (“AmCham”) is proud to be working closely with both the Slovak and international business communities in bringing together ideas, and formulating a vision, for Slovakia and Foreign Direct Investment (“FDI”). Our aspiration is that Slovakia becomes the favored, premium FDI destination in Europe for international companies by 2020. AmCham Slovakia, in cooperation with ECENTER has published the "INDUSTRY REPORT 2013 – Real Estate” brochure. Frequently, many businesspeople do not have or cannot find appropriate information about Slovakia’s real estate market that would assist them in their selection and decision process. Therefore, we will provide concise, well presented information about the local market for companies already in Slovakia as well as those looking to relocate or invest into Slovak real estate market. This brochure provides you with information on retail, logistics, residential, and office estate in the country and some comparisons with other relevant countries. There will be relevant charts, tables, maps and descriptions. 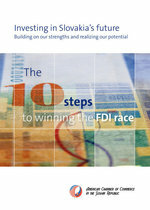 All AmCham members will receive a copy of this publication by regular mail. And all members are able to download "INDUSTRY REPORT 2013 – Real Estate" brochure in PDF file on www.amcham.sk. One of the major goals of the American Chamber of Commerce in Slovakia (AmCham) is to improve the business environment in Slovakia for everyone – be it local companies, foreign investors and large or small businesses. As a major initiative, AmCham Slovakia conducted a survey of SMEs’ needs in Slovakia. The main objective was to specify what the new Slovak government could – and should – provide to smaller companies to make the Slovak business environment more SME-friendly. The survey ran in 2010 and 2013.. The online survey was supplemented by in-depth interviews and a focus group with chosen representatives of SMEs. Committee on Business-Academic Cooperation was established in 2007 to contribute to the reform of the Slovak educational system and to foster cooperation between schools and businesses, this committee currently includes more than 20 AmCham member companies. 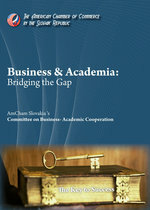 The Committee on Business-Academic Cooperation is one of the most active and productive committees of AmCham Slovakia.